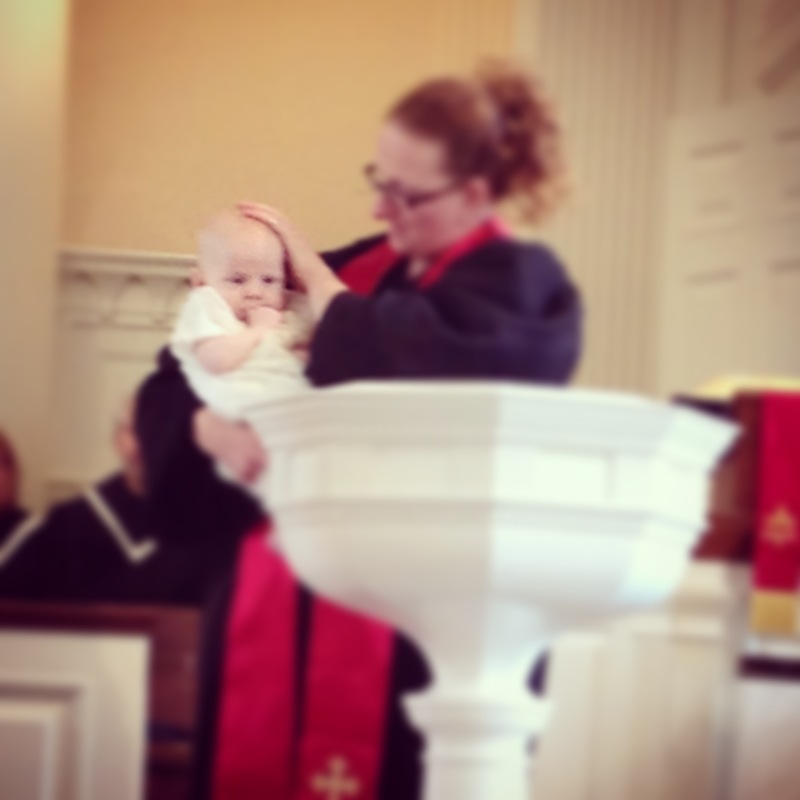 Pastor/post author Jenn DiFrancesco baptizing her youngest child. Let us enter, O Spirit, into your heart of love, so that we are open to be healed by grace. And so, then, are able to lead or follow at the Spirit’s request. Amen. Do you remember your baptism? This is a question that was once posed to me and others during a children’s message when I was in elementary school. I wanted to remember my baptism. I was sure that I did remember it. I remembered the Rev. Chuck Weaver who baptized me, I remembered the yellow dress. Surely I could remember my own baptism! So I waved my hand wildly in the air, indicating to the pastor, that YES, I did remember my baptism. My best friend sitting next to me, also waved her hand, saying YES she, too, remembered her baptism. Because this children’s message took place in the church where both my friend and I been baptized, nearly everyone else present did remember my baptism…and they remembered that I was less than a year old. Our hand-waving was accompanied by the smiles and stifled laughter of the adults in the congregation. If you were baptized as an infant, it is likely that you, too, remember only the stories and pictures, and perhaps the feel of the baptismal gown that has been shown to you along with the telling of the stories of your baptism. Most of us have had the experience of being present at a baptism, perhaps the baptism of one of our siblings, one of our own children or godchildren, a dear friend. Baptisms are a happy time in the life of a congregation. They are representative of new life. The welcoming of a child or adult into the church. Yet baptisms are also serious business. In becoming one of God’s children, promises are made for this child by the parents, or by the person for himself, and they are accompanied by the congregational promises as well. This child will be brought up knowing God and hearing God’s Word. This child or adult has been committed to the service of the church. In Jesus’ time baptisms were serious business, too. Jesus was baptized that day by the Jordan, and God claimed him as God’s Son. And that baptismal event made all the difference in Jesus’ life. Jesus went from being an obscure carpenter to a leader who preached to the crowd, healed the sick, ate with the disaffected, and challenged the authorities. And God uses our baptism to adopt us as God’s children, marking us with the cross of Christ, and starting us on a life of sharing and ministering to others. Our baptisms may not have been accompanied by the dramatic sign of the heaven tearing open. But in baptism, the Lord does indeed fill us with the Holy Spirit and mark us as one of God’s own. We are graced, we are saved, and we are called to be stewards of those gifts which are opened to us in baptism. Now, let me bring you back to where we started: “Do you remember your baptism?” Despite my wild affirmative hand-waving at a First Presbyterian Church of Plainsboro children’s sermon, it is unlikely that any of us who were baptized as infants actually remember the event of our baptism. A better question might be… A better question is: Do you remember that you ARE baptized? ~Do you remember your baptism? ~What do you think it mean to be “a beloved child of God”? ~How can the remembrance of your baptism sustain and challenge you this new year? Martin Luther, a Reformer and Theologian said this, “When you wash your face, remember your baptism.” This day, take a moment, when you wash your face and/or your hands, to remember and give thanks for your baptism and the promises made on that day. Tags: baptism, promises, remember. Bookmark the permalink.